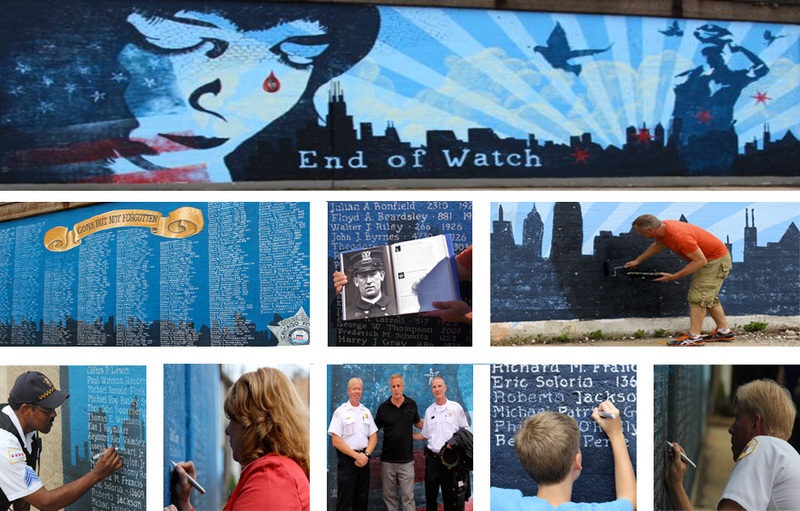 In early 2012, a request to create a mural to honor fallen police officer Michael Flisk was put forth to the 45th ward office. The Nonprofit organization Arts Alive Chicago worked with the Alderman’s office, the Fraternal Order of Police, and the Policemen’s Memorial Fund for input and approval. During discussions it was recommended that the mural honor all fallen officers. The Union Pacific granted permission to Arts Alive Chicago to paint the mural on the west-facing foundation wall of their Montrose station at the intersection of Montrose and Knox. The left third of the mural has a panel that list all fallen Chicago Police Officers dating back to the formation of the force in 1837. I worked to raise funds for the mural and had the honor of being second artist to lead Cyd Smillie to execute Jill Arena’s design titled End of Watch.